Retention and Graduation Rates help the College understand how well our students are able to be persistent to completion in their educational goals. The College evaluates these measurements to help identify and remove barriers to student success and to help forecast annual enrollment levels and set new student recruiting targets. Retention Rates indicate the percentage of enrolled students that persist in continuous enrollment at this university from one year to the next. Graduation Rates indicate the percentage of enrolled students that graduate from this university after specified numbers of years from their initial enrollment at this university. Here we present the most recent information about Providence alumni and their careers and graduate school transitions following graduation.  This information was collected during a June 2016 survey of Providence alumni. The “outcomes” of Providence Christian College are graduates firmly grounded in biblical truth, thoroughly educated in the liberal arts and fully engaged in their church, their community and the world for the glory of God and for service to humanity. We accomplish this goal through Faith-Guided Learning™ and our graduates embody this mission. 1) Interdisciplinary Competence: Students will be able to produce evidence of the ability to make connections across the disciplines of the Liberal Arts (humanities and sciences) curriculum. 2) Creative- and Critical-Thinking: Students will be able to critically evaluate claims and research, consider multiple perspectives, discern sound premises, and develop biblical viewpoints and creative solutions to problems. 4) Communication: Students will be able to communicate across diverse audiences effectively, creatively, and persuasively in oral, visual, and written formats. At Providence, we focus on a single liberal arts degree on purpose to broaden the minds of our students and then supplement that core with the choice of two additional concentrations geared toward specific career goals.